Singaporeâ€™s tropical climate has little variation in temperature throughout the year ensuring hot, humid days outside the monsoon seasons. Daytime temperatures average 26Â°Cand 24Â°C at night during December and January, and 31Â°C during the day and 26Â°C at night for the rest of the year. 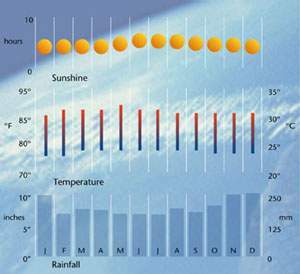 The daily average humidity is 84%, often exceeding 90% at night. It rains most days and dramatic thunderstorms can occur throughout the year, usually in the afternoon. It is advisable to wear lightweight natural fibres like cotton and linen.